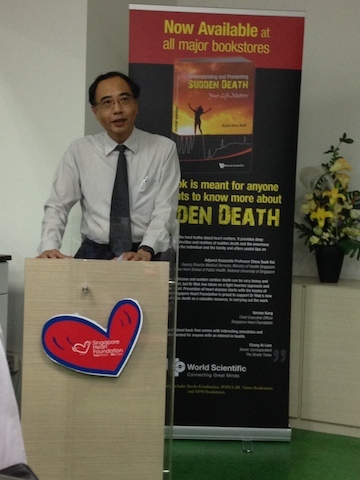 Dr Mak Koon-Hou at his book launch. With many people dying at a younger age, suddenly and unexpectedly, family members and friends are finding it hard to come to terms with such a loss. 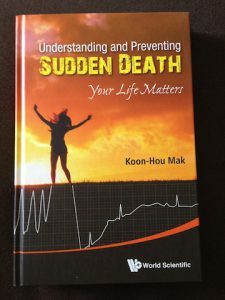 As such cardiologist Dr Mak Koon-Hou from Gleneagles Hospital has come up with his latest book called “Understanding and Preventing Sudden Death: Your Life Matters” so people can make sense of the condition and prevent it. According to the Singapore Heart Foundation (SHF) and supporter of the book, every day, 15 people die from cardiovascular disease (heart disease and stroke). Last year, cardiovascular disease accounted for 29.9 percent of all deaths, which means that nearly one out of three deaths in Singapore can be attributed to heart disease and stroke. Those older are also not immune as the incidence of sudden death increases with age. 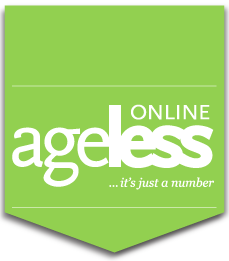 According to Dr Mak’s book, for men, it was about 100 per 100,000 for 50 years old and 800 per 100,000 for 75 years old. The rate of sudden death is generally lower for women, about 30 percent of that of men and lags behind by at least 10 years. But this trend tends to reverse after the age of 65. Dr Mak's book on sudden death. Dr Mak also noted that the blood vessels don’t necessarily have to be severely narrow and one may not have symptoms to experience a heart attack. His book contains several case studies and takes a light-hearted approach to a heavy topic. The book is available at major bookstores at S$55 for the hardcover and S$28 for the paperback. Prevention is always better than cure or treatment. Our heart works 24/7 since birth. Is it any wonder than that the heart arteries get blocked or choked over time/yrs without any maintenance at all. Once the heart arteries are choked, the heart stops pumping & resulting in a cardiac arrest or heart attack. Try driving a car without any maintenance at all & see how far or how long it can last. So, why can’t we be as meticulous with our heart arteries as our own car? In US, more & more people are using natural supplements to clear up/melt the plaques inside our heart arteries. Such natural supplements like silkworm extract or Omega-7 taken daily have been tried & tested to melt the plaque inside the heart arteries. So, why is this not known in such a medically-advanced nation as S’pore? It really baffles me beyond words.